You start by taking a round bread, making holes throughout the top then soaking it in cream. Yes, soaking it in CREAM! You spoon the cream that collects in the bottom of the dish back in every once in a while over the coarse of a couple hours until it’s nice and saturated. Then you fill the holes with Emmental cheese. You grate some additional cheese on top then bake at 350 until the top is golden and the cheese is melty. This bread was GLORIOUS. I can only imagine taking the leftovers and making cheesy bread French toast the next morning (alas, I didn’t get up early enough to share in the leftovers so I’ll have to make this myself one of these days when company is coming. 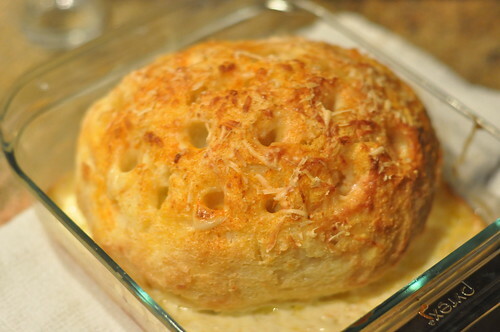 Have you ever had a cheesy bread like this one? If not, what’s your favorite cheesy bread form?